More than five years after President George W. Bush's declaration of a global war against terrorism, the Iranian regime continues to embrace suicide terrorism as an important component of its military doctrine. In order to promote suicide bombing and other terrorism, the regime's theoreticians have utilized religion both to recruit suicide bombers and to justify their actions. But as some factions within the Islamic Republic support the development of these so-called martyrdom brigades, their structure and activities suggest their purpose is not only to serve as a strategic asset in either deterring or striking at the West, but also to derail domestic attempts to dilute the Islamic Republic's revolutionary legacy. Such strategy is apparent in the work of the Doctrinal Analysis Center for Security without Borders (Markaz-e barresiha-ye doktrinyal-e amniyat bedun marz), an Islamic Revolutionary Guard Corps think tank. Its director, Hassan Abbasi, has embraced the utility of suicide terrorism. On February 19, 2006, he keynoted a Khajeh-Nasir University seminar celebrating the anniversary of Ayatollah Ruhollah Khomeini's fatwa (religious edict) calling for the murder of British author Salman Rushdie. As Khomeini often did, Abbasi began his lecture with literary criticism. He analyzed a U.S. publication from 2004 that, according to Abbasi, "depicts the prophet of Islam as the prophet of blood and violence." Rhetorically, he asked, "Will the Western man be able to understand martyrdom with such prejudice? [Can he] interpret Islam as anything but terrorism?" The West sees suicide bombings as terrorism but, to Abbasi, they are a noble expression of Islam. So what is terrorism if not suicide bombing? To Abbasi, terrorism includes any speech and expression he deems insulting to Islam. According to press coverage of his lecture, Abbasi noted that "[German chancellor] Merkel and [U.S. president] Bush's support of the Danish newspaper, which insults Islam's prophet, has damaged their reputation in the Islamic world and has raised the question of whether Christianity, rather than Islam, is of terrorist nature." From the Iranian leadership's perspective, therefore, Jyllands-Posten's cartoons are evidence of Christian terrorism. By Abbasi's definition, Iran may not sponsor terrorism, but it does not hesitate to promote suicide attacks. He announced that approximately 40,000 Iranian estesh-hadiyun (martyrdom-seekers) were ready to carry out suicide operations against "twenty-nine identified Western targets" should the U.S. military strike Iranian nuclear installations. Such threats are not new. According to an interview with Iran's Fars News Agency released on Abbasi's weblog, he has propagated haras-e moghaddas (sacred terror) at least since 2004. "The front of unbelief," Abbasi wrote, "is the front of the enemies of God and Muslims. Any deed which might instigate terror and horror among them is sacred and honorable." On June 5, 2004, he spoke of how suicide operations could overcome superior military force: "In ‘deo-centric' thought, there is no need for military parity to face the enemy … Deo-centric man prepares himself for martyrdom while humanist man struggles to kill." Abbasi's rise to prominence in the state-controlled Iranian media coincides with the growth of a number of organizations that have constrained those prone to moderation within the Islamic Republic. Take, for example, the Headquarters Commemorating the Martyrs of the Global Islamic Movement (Setad-e Pasdasht-e Shohada-ye Nehzat-e Eslami), an organization founded in 2004 as a protest against President Mohammad Khatami's attempts at improving Iran's relations with Egypt. The organization's prominence continued to grow throughout the year. On June 5, 2004, the reformist daily Shargh granted Mohammad-Ali Samadi, Headquarters' spokesman, a front page interview. Samadi has a pedigree of hard-line revolutionary credentials. He is a member of the editorial boards of Shalamche and Bahar magazines, affiliated with the hard-line Ansar-e Hezbollah (Followers of the Party of God) vigilante group, as well as the newspaper Jomhouri-ye Eslami, considered the voice of the intelligence ministry. Samadi said he had registered 2,000 volunteers for suicide operations at a seminar the previous day. 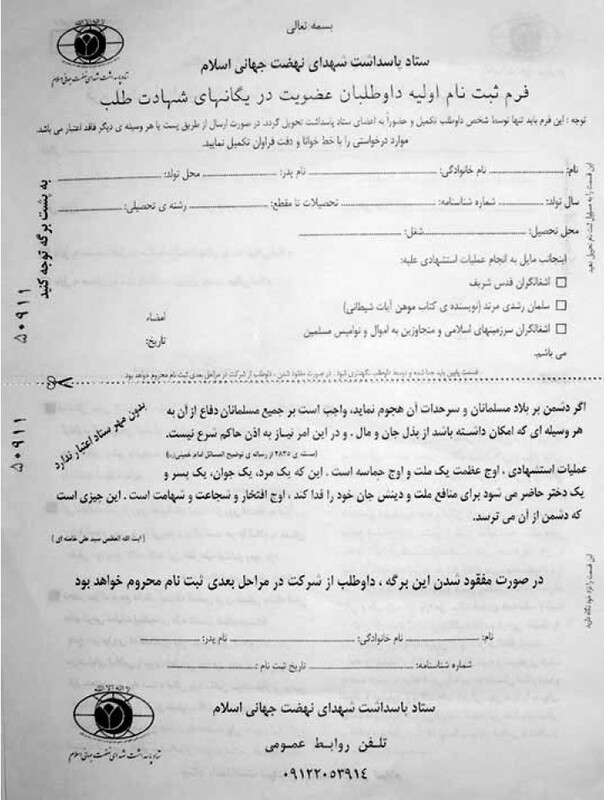 Copies of the registration forms (see Figure 1) show that the "martyrdom-seekers" could volunteer for suicide operations against three targets: operations against U.S. forces in the Shi‘ite holy cities in Iraq; against Israelis in Jerusalem; and against Rushdie. 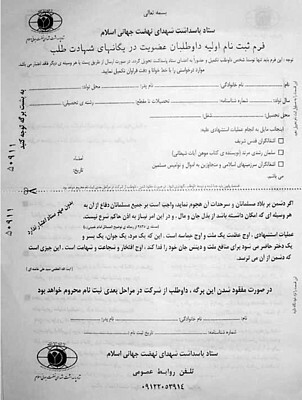 The registration forms also quote Khomeini's declaration that "[I]f the enemy assaults the lands of the Muslims and its frontiers, it is mandatory for all Muslims to defend it by all means possible [be it by] offering life or property," and current supreme leader Ali Khamene'i's remarks that "[m]artyrdom-seeking operations mark the highest point of the greatness of a nation and the peak of [its] epic. A man, a youth, a boy, and a girl who are prepared to sacrifice their lives for the sake of the interests of the nation and their religion is the [symbol of the] greatest pride, courage, and bravery." According to press reports, a number of senior regime officials have attended the Headquarters' seminars. The Iranian officials appeared true to their word. During a September 2004 speech in Bushehr, home of Iran's declared nuclear reactor, Samadi announced the formation of a "martyrdom-seeking" unit from Bushehr while Hossein Shariatmadari, editor of the official daily Keyhan, called the United States military "our hostage in Iraq," and bragged that "martyrdom-operations constitute a tactical capability in the world of Islam." Then, on November 23, 2004, in response to the U.S. campaign against Iraqi insurgents in Fallujah, Samadi announced the formation of the first suicide unit. Named after the chief bomb-maker of Hamas, Yahya Ayyash, also known as Al-Muhandis (The Engineer) assassinated on January 5, 1996, it consisted of three teams of unknown size: the Rim Saleh ar-Riyashi team, named after Hamas's first female suicide bomber; the Mustafa Mahmud Mazeh team, named after a 21-year-old Lebanese who met his death in a Paddington hotel room on August 3, 1989, priming a book bomb likely aimed at Salman Rushdie; and the Ahmad Qasir team, named after a 15-year-old Lebanese Hezbollah suicide bomber whose operation demolished an eight-story building housing Israeli forces in Tyre, southern Lebanon, on November 11, 1982. Samadi said there would be an additional call for volunteers at Tehran's largest Iran-Iraq war cemetery, the Behesht-e Zahra, the following week, and even promised to consider establishing special elementary schools to train for suicide operations. He kept his word. On December 2, 2004, the Headquarters gathered a crowd in the Martyr's Section of Behesht-e Zahra, where those who conducted suicide operations are honored. According to the Iranian Mehr News Agency, the organization unveiled a memorial stone commemorating the "martyrs" killed in the 1983 Hezbollah attacks on the U.S. Marine and French peacekeepers' barracks in Beirut. They set the stone next to one commemorating Anwar Sadat's assassin. Samadi concluded the ceremony with a raging speech, declaring, "The operation against the Marines was a hard blow in the mouth of the Americans and demonstrated that despite their hollow prestige and imagined strength … they [have] many vulnerable points and weaknesses. We consider this operation a good model. The cemeteries in which their dead are buried provide an interesting view and cool the hearts of those Muslims who have been stepped upon under the boots of the Yankees while they were ignored by the international community." The suicide corps continued to expand even though there is no evidence that their patrons have made them operational. In April 2005, the semi-official daily Iran announced convocation of a unit of female suicide bombers nicknamed the Olive Daughters. The Baztab news website, which is associated with Mohsen Rezai, head of the Islamic Revolutionary Guard Corps from 1981 to 1997 and since secretary of the Expediency Council, cited one Firouz Rajai-Far, who said, "The martyrdom-seeking Iranian women and girls … are ready to walk in the footsteps of the holy female Palestinian warriors, realizing the most terrifying nightmares of Zionists." Rajai-Far, a former hostage taker at the U.S. Embassy in Tehran, holds the license for Do-Kouhe (Two Mountains, referring to one of the fiercest battlegrounds of the Iran-Iraq war) magazine, which is affiliated with the vigilante organization Ansar-e Hezbollah. Ayatollah Hossein Nouri Hamedani bestowed theological legitimacy upon such suicide terror operations in a written message to the gathering. Attendance at the rally indicates some endorsement and a support network for suicide operations. Attending the rally were Palestinian Hamas representative Abu Osama al-Muata; Muhammad Hasan Rahimian, the supreme leader's personal representative to the powerful Bonyad-e Shahid (The Martyr Foundation); Mehdi Kuchakzadeh, an Iranian parliamentarian; Mustafa Rahmandust, general secretary of the Association for Support to the People of Palestine; and model female fighter Marziyeh Hadideh Dabbagh. More vocal expressions of solidarity are limited, however. The Mehr News Agency reports only a single declaration of solidarity from the spokesman of the University Basij at the Tehran branch of Islamic Azad University, who compared contemporary suicide operations with the "revolutionary deeds" of Mirza-Reza Kermani, the assassin of Nasser al-Din Shah, a nineteenth-century king vilified by the Islamic Republic, and with Navvab Safavi, founder of the Fadayian-e Islam and famous for assassinating the liberal nationalist author and historian Ahmad Kasravi. Still, that a group at the Islamic Azad University endorsed the organization is significant. Founded to broaden the reach of education after the Islamic Revolution, the university has several dozen satellite campuses across the country and today is the largest higher education system in Iran. On May 13, 2005, officials declared the second suicide terror unit, the so-called "Martyr Shahada unit," consisting of 300 martyrdom-seekers, to be ready. Some months later, there was a gathering of the "martyrdom-seekers" at Shahrud University. While the invited Hamas representative did not attend, they watched Mahmoud Ahmadinejad's speech from the "World without Zionism" conference on screen. While the status of the third and fourth suicide brigades remains unclear, new suicide units continue to declare their readiness. In May 2006, a fifth "martyrdom-seeking" unit, named after Commander Nader Mahdavi, who died in a 1988 suicide mission against the U.S. Navy in the Persian Gulf, declared itself ready to defend Iran. The Headquarters even claims to have recruited "thirty-five foreign Jews" for suicide attacks. Lebanese Hezbollah's abduction of two Israeli soldiers on July 12, 2006, provided another press opportunity for Iranian suicide brigades. On July 17, 2006, Arya News Agency reported an expedition of two "martyrdom-units," one consisting of eighteen and the second consisting of nine "martyrdom-seekers," to Lebanon. At demonstrations in Tehran and Tabriz ten days later, sixty Iranian volunteers declared their readiness for holy war. There was also a rally in Rasht, capital of the Caspian province of Gilan, on July 29. But despite the bravado, Iranian police stopped a caravan of self-described "martyrdom-seekers" at the Turkish border. A leftist weblog quoted the governor of the West Azerbaijan province in which the border crossings with Turkey lie as saying he received a telephone call from Ahmadinejad asking him to stop the suicide units. While the Iranian government seeks propaganda value out of announcements of new suicide units, it remains in doubt just how committed recruits are. When an Iranian youth magazine interviewed Rajai-Far, an organizer of the Olive Daughters, she remained elusive about how serious her recruits were about suicide. Despite its rhetoric and the occasional rally, there is little evidence that the Iranian government has established camps to train suicide terrorists. While the Revolutionary Guards operate a network of bases inside Iran, there is little coverage—at least in open source newspapers and Iranian media—of actual training of those recruited by the Headquarters. There have been two mentions of a military exercise for the suicide brigades around the Karaj Dam. Muhammad-Reza Ja'afari, commander of the Gharar-gah-e Asheghan-e Shahadat (Congregation of the Lovers of Martyrdom) training camp, referred to one exercise as the "Labeik Ya Khamene'i" (We are responding to your call, Khamene'i). With the exception of the representation of Hamas in the early development of the Iranian "martyrdom-seekers," there is little proof of organizational links to external terrorist organizations. Nor does the training of any unit mean that the Iranian government is prepared to deploy such forces. In June 2004, Samadi explained that the "activities of the Headquarters will remain theoretical as long as there is no official authorization, and martyrdom-seeking operations will not commence unless the leader [Khamene'i] orders them to do so." But command and control remain vague. Hussein Allah Karam, a well-known figure from Ansar-e Hezbollah without formal ties to the "martyrdom-seekers," stresses that Khamene'i need not grant permission for any exercises since the trainees are not armed. Evading the question of what need there is to create "martyrdom-seeking" units parallel with the Basij, Karam responded, "Martyrdom-seeking groups are nongovernmental organizations,"  not part of Iranian officialdom. The Basij, a paramilitary militia of irregulars loosely charged with defending the revolution, has not been happy with the competition. Basij Commander Mohammad Hejazi condemned the Headquarters' declaration that it sought to dispatch suicide units to Lebanon. "Such actions have absolutely no link to [Iran's] official apparatus and only serve propaganda aims," he declared. In an indirect critique of the suicide units' leadership, he added: "Some seemingly independent groups are trying to attract … the youth with no coordination with official institutions and without the approval of the command structure for propaganda purposes. Their goals might be noble, but their means are not correct." Government spokesman Gholam-Hussein Elham underlined this argument. The nongovernmental status of the Headquarters and the "martyrdom-seekers" was reinforced in comments of an anonymous Revolutionary Guards commander to Shargh. He explained, "Since the Headquarters … is a nongovernmental organization, the organization does not look for orders from the military in case they should take action. Their operations are to be compared with the martyrdom-operations of the Palestinians which are not related to the government of Iran." The foreign ministry, which under Khatami was more reformist than the hard-line Revolutionary Guards, referred to the Headquarters members as "irresponsible elements" who did "not reflect the line of government," and, on August 3, 2006, Iranian parliamentarian Mehdi Kuchekzadeh called the Headquarters an NGO during a rally at Behesht-e Zahra. Baztab reacted angrily to the publication of advertisements for "martyrdom operations" in Partov, the hard-line monthly of the Imam Khomeini Research Institute in Qom, accusing the publication, the Headquarters, and the director of the institute, Ayatollah Mohammad Taghi Mesbah Yazdi—perhaps the most radical of the Islamic Republic's religious theoreticians—of enabling outsiders more easily to label Iran as a terror sponsor. Vice President Mohammad Ali Abtahi expressed similar sentiments. "Martyrdom-operations against the interests of other states must remain secret … The public exposure of such gatherings is the very proof that they are not going to do anything," he wrote. Abtahi accuses Yazdi of harming the national interests of Iran, and more seriously, of attempting to create parallel institutions in the Islamic Republic in order to eliminate internal opposition to his political interests. Such attacks called member of the parliament Shokrollah Attarzadeh to the defense of Mesbah Yazdi. Attarzadeh said that volunteers without connection to the ayatollah organized the "martyrdom operations," which he claimed, at any rate, to be purely defensive. Baztab's hostility toward Mesbah Yazdi is significant. The Islamic Republic of Iran has long sanctioned widespread use of terror and vigilante justice to keep its citizens in line. Perhaps the most prominent example was the 1997-99 serial killings in which the Iranian secret services systematically liquidated Iranian intellectuals with the aim of intimidating dissidents. This case has been subject to extensive debate, causing a considerable uproar among the Iranian public. The Iranian Ministry of Intelligence and National Security claims that the murders were committed by rogue cells in the ministry. However, Iran's most famous journalist and political dissident, Akbar Ganji, accuses the former minister of intelligence, Ali Fallahian, and Khamene'i of responsibility for the killings. During the 2005 presidential campaign, the reformist daily Rooz warned of the formation of a new Forghan, a radical Islamist group from the early days of the Islamic Revolution. Ali Yunesi, minister of intelligence, and Abtahi both seconded such concerns. Baqir Nobakht, spokesman for ‘Ali Akbar Hashemi Rafsanjani's election campaign, criticized Yazdi by suggesting that he sought to use the "army of martyrdom-seekers" for operations against his political enemies inside Iran. For more than a century, hard-line officials have turned to vigilante groups during periods of political upheaval. Their political influence is noticeable. The 1979 Islamic revolution only strengthened such tendencies, and there is no doubt that the patrons of the "martyrdom-seekers" have used the Headquarters as a tool to maintain revolutionary values against those that might ameliorate them. Here, the crisis regarding the change in Iran's policy towards Egypt is instructive. From almost the start of the Islamic Republic, there has been considerable tension between Tehran and Cairo. Ayatollah Khomeini objected to Egyptian president Anwar Sadat's recognition of and peace treaty with Israel. After Sadat's assassination, Iranian authorities named a street after his assassin, Khaled Islambouli. For years after, this action has been an irritant in Egyptian-Iranian relations. But in January 2004, toward the end of Muhammad Khatami's presidency, the Mehr News Agency reported that the Iranian government had asked Tehran's city council to change the street name. The city council acquiesced, renaming it "Intifada Street." Foreign Ministry spokesman Hamid-Reza Asefi attributed the decision to improving Egyptian-Iranian relations. The Headquarters protested, sending a letter to then-mayor Mahmoud Ahmadinejad. Ahmadinejad defended the decision in the name of promoting unity among Muslim countries "in order to face the global Zionist front." The Headquarters responded with a press release, and a demonstration against the decision. Mehdi Chamran, the Tehran city council chairman and brother of the late commander of the Revolutionary Guard, Mostafa Chamran, said that the foreign ministry had imposed the decision but that he preferred to honor Islambouli. In an Iranian-style compromise, the street was finally called Mohammad al-Durrah Street after a 12-year old boy who was caught in crossfire and killed in the opening days of the second intifada. But the Headquarters was successful in scuttling rapprochement with the largest Arab state to make peace with Israel. On January 28, 2004, the London-based Arabic daily Asharq al-Awsat announced that Egyptian president Hosni Mubarak would not visit Iran due to the presence of a picture of Khaled Islambouli on public display in Tehran. Those associated with the Headquarters appear willing to use irregular forces against enemies not only foreign but also domestic. Groups connected to Mesbah Yazdi roughed up Rafsanjani on June 5, 2006, in Qom. In the past, vigilantes directed such attacks against reformers or free thinkers, but now the first generation of the Iranian revolutionaries such as Rafsanjani receive the same treatment. And as in the past, the violence is connected to the same groupings in Iranian politics: the Keyhan editor Shariatmadari, now close to the Headquarters, as the intellectual proponent of violence against liberal elements, and Hussein Allah Karam of Ansar-e Hezbollah, now also linked to the "martyrdom-seekers" and, more directly, with Ansar-e Hezbollah itself, which publishes advertisements for the Headquarters and interviews with their spokesmen. Since 9-11, the increased focus on international terror has amplified fear of terrorism. By forming suicide terrorists units, Tehran can, at a minimum, exploit such fear. Already, Western policymakers warn that any strike against Iran could spark a resurgence of Iranian-backed terror. That the Islamic Republic has already formed suicide bomber brigades underscores that point. But the fact that the Iranian leadership must embrace such nonconventional deterrents may suggest that Tehran recognizes that the Iranian military is weaker than Iranian figures admit. However, the suicide units may serve a dual function. They are, in effect, the most radical factions' guns-for-hire, unquestioning loyalists who are willing to die to preserve revolutionary values. As such, Iranian hard-liners can use them to saber-rattle as well as to keep reformers and liberals at bay. This may pose the more immediate threat since the willingness of Iranian hard-liners to use violence against their internal political opponents, could pose an almost insurmountable impediment to those who might seek to liberalize the Islamic Republic from within. Ali Alfoneh is a Ph.D. fellow in the department of political science, University of Copenhagen, and a research fellow at the Royal Danish Defense College. He thanks Henrik Joergensen and Thomas Emil Jensen, both from the Institute for Strategy at the Royal Danish Defense College, for their input. Doctrinal Analysis Center for Security without Borders website, accessed Aug. 8, 2006. Shargh (Tehran), Feb. 20, 2006. Hassan Abbasi weblog, June 5, 2004, accessed Aug. 6, 2006. Abbasi weblog, June 5, 2004. Mehr News Agency (Tehran), Jan. 5, 2004. Ruhollah Khomeini, Tawzih al-Masa'il, 9th ed. (Tehran: Entesharat-e Iran, 1999), pp. 454-5. Ali Khamene'i, May 1, 2002 speech. Iran (Tehran), Sept. 11, 2004. For a pictorial report, see Mehr, Dec. 2, 2004. Baztab (Tehran), Apr. 21, 2005. Baztab, Apr. 21, 2005; Shargh, Apr. 23, 2005. Rooz (Tehran), Nov. 18, 2005. Arya News Agency, July 17, 2006. Peik Net (Tehran), Aug. 3, 2006. Javan (Tehran), July 9, 2005. Jahan-e Eghtesad (Tehran), July 25, 2006. E'temad (Tehran), Aug. 3, 2006. See Mohammad Ali Abtahi, Webnevesht website, July 27, 2005. Akbar Ganji, Tarik-khaneh-ye ashbah. Asibshenasi-ye gozar be dowlat-e democratic-e tosé-gara (Tehran: Tarh-e No, 1999), pp. 408-10; idem, Alijenab-e sorkhpoush va alijenaban-e khakestari: Asibshenasi-ye gozar be dowlat-e demokratik-e tose'e-gara (Tehran: Tarh-e No, 2000), pp. 210-8. For more information, see Rasoul Ja'farian, ed., Jaryan-ha va sazeman-ha-ye mazhabi-siyasi. Sal-ha-ye 1320-1357 (Tehran: Markaz-e Asnad-e Enghelab-e Eslami, 2004), pp. 568-82; Michael Rubin, Into the Shadows. Radical Vigilantes in Khatami's Iran (Washington, D.C.: The Washington Institute for Near East Policy, 2001), pp. 21-2. Iranian Students' News Agency (ISNA), July 16, 2005 ; Abtahi, Webnevesht, July 27, 2005. Richard Cottam, Nationalism in Iran (Pittsburgh: University of Pittsburgh Press, 1964), pp. 37-8; Marvin Zonis, The Political Elite of Iran (Princeton: Princeton University Press, 1971), p. 348. Rubin, Into the Shadows, p. xviii. Shahrough Akhavi, "Egypt: Political and Religious Relations in the Modern Period," Encyclopaedia Iranica Online, accessed Aug. 23, 2006; William Millward, "Egypt and Iran: Regional Rivals at Diplomatic Odds," Commentary, May 1992; Neshat Daily (Tehran), June 6, 1999, in BBC Summary of World Broadcasts, June 8, 1999; Al-Hayat (London), June 7, 1999, in BBC Summary of World Broadcasts, June 9, 1999. BBC News, Jan. 5, 2004. For a pictorial account of the attack against Rafsanjani, see ISNA, June 5, 2006. Firouz Rajai-Far, interview, Ya Lesarat al-Hossein (Ansar-e Hezbollah, Tehran), May 10 and 17, 2006; see advertisements for "martyrdom operations," Ya Lesarat al-Hossein, Apr. 12, 2006. Related Topics: Iran, Suicide terrorism, Terrorism | Ali Alfoneh | Winter 2007 MEQ receive the latest by email: subscribe to the free mef mailing list This text may be reposted or forwarded so long as it is presented as an integral whole with complete and accurate information provided about its author, date, place of publication, and original URL.